Don't forget for all your portable hire needs we are here to help. We have a large number of happy customers from our full turnkey operation that make everything quick and hassle free for you. We arrange all transport, site work and pick up of buildings once you have finished the hire contract. We have portable canteen units, Drying rooms, Welfare units, small Portable office units, storage containers all for hire. We also hire Modular buildings ranging from 24ft x 20ft to 32ft and even 40ft x 80ft. Whatever your needs we are here to help. Minimum hire period 4 months. 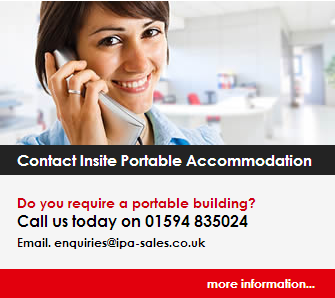 Please visit www.insiteportableaccommodation.co.uk for more information or contact 01594 835024 and we will be happy to help.